Here’s an interesting way to spend a June afternoon on the Sunset Strip. 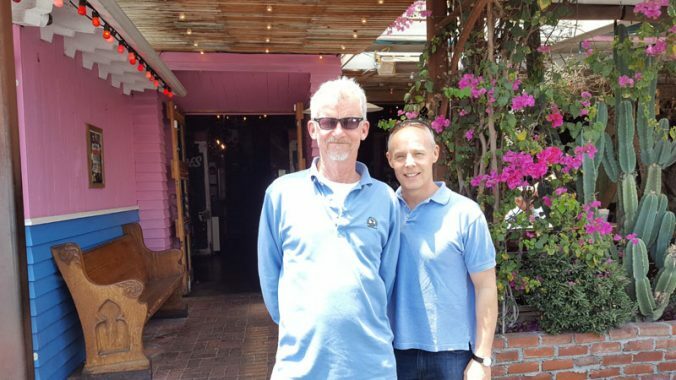 Have lunch and a drink at the Pink Taco with Martin Turnbull, my friend, the author of The Garden of Allah novel series, and Tom Sturges, a music executive who is the son of Preston Sturges, one of the most brilliant and eccentric writers and directors in the studio era. The location was significant. Pink Taco occupies hallowed ground in Sunset Strip history. Originally a residence built in 1926, Preston Sturges extensively (and expensively) renovated it 14 years later and then opened it as a celebrity nightspot called The Players. 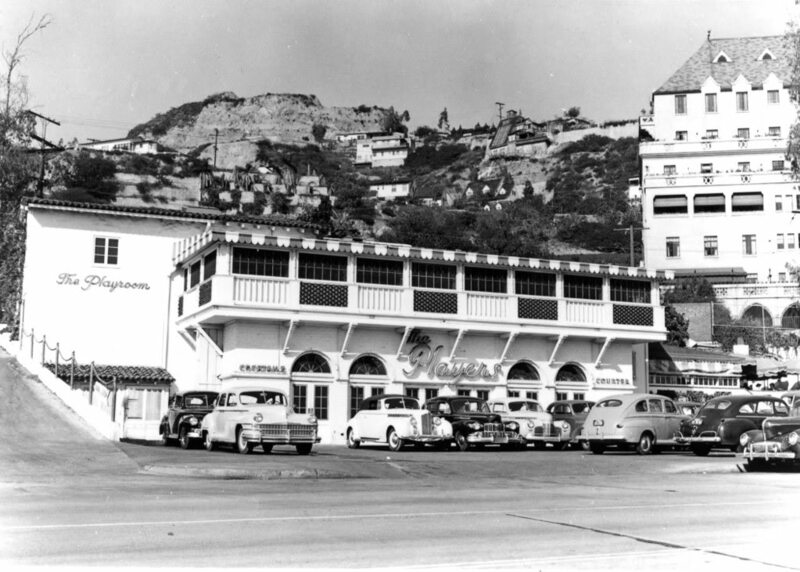 The Players quickly became the luxe hangout of stars and celebrities like Humphrey Bogart and Lauren Bacall, F. Scott Fitzgerald, Dorothy Parker, Barbara Stanwyck, Joel McCrea, Rudy Vallee, William Faulkner, George S. Kaufman, Charlie Chaplin, Orson Welles and Howard Hughes. The party ended a decade later when Sturges’ brilliant career — he wrote and directed “The Great McGinty” (1940) for which he won the first Oscar for Best Original Screenplay, “Christmas in July (1940), “The Lady Eve” (1941), “Sullivan’s Travels” (1941), “The Palm Beach Story” (1942), “The Miracle of Morgan’s Creek” (1944) and “Hail the Conquering Hero” (1944), among others — began to sputter and the money ran out. The Players closed in 1953 when the IRS put a lien on its income and eventually sold its contents to pay its tax debts. The building today is but a vestige of Tom’s father’s creation. Having gone through several iterations — in recent memory it was Miyagi, a Japanese restaurant, and the Roxbury, a Brat Pack hangout — the interior has been stripped to its bare bones. Literally. The wall surfaces and ceilings have been removed to expose wooden platting and beams. The effect is to give the interior a rustic feel in keeping with Pink Taco’s cantina theme — but it is anything but glamorous. After lunch, Tom — who said he’d only visited the building a few times — led us on an impromptu tour of the sprawling building. We explored our way through a rabbit warren of dining areas, bars and kitchens on three floors. There were few traces of Preston Sturges’ original concepts, and we didn’t find the two famous features said to be uncovered during the Pink Taco renovation a few years ago. One was a revolving stage — Preston Sturges is believed to have built the world’s first dinner theatre inside the Players. The other is a tunnel, also recently uncovered, that led from the Players through the hill under Marmont Lane into the bowels of the Chateau Marmont Hotel next door. The manager confirmed that the tunnel did indeed exist but said it was all boarded up. And this leaves us with a mystery: Who built the tunnel? Was it Preston Sturges, or some earlier or later owner? And, just as intriguingly — why was it built? Received wisdom says Sturges built the tunnel so that The Players’ famous guests and their romantic conquests could slip away through the tunnel to the hotel unnoticed. But tunnels are expensive feats of engineering and construction. Why build a tunnel when there were simpler ways for movie stars to make their way along the 0.1 mile trek (according to Google Maps) from the club to the hotel? Another theory is that the tunnel was used to store and transport liquor store into the hotel. This might make sense if The Players had existed then. But it was a residence until about 1936, when it was converted into a wedding chapel. During Prohibition, which ended in 1934, it was home to a stage actor named William Morris, the father of Chester Morris, a popular movie star. Maybe William Morris had a side hustle as a bootlegger. Anything is possible. If you know why the tunnel was built — or if you have a favorite theory — we’d love to hear it. Leave it in the comments or email us at info at playgroundtothestars.com.